Following on from my review of the Hershey's Symphony bar, I also found this Nestlé Baby Ruth at B&M Bargains. It's a bar I've never tried before as I generally avoid most American snacks...the inclusion of ingredients like "high fructose corn syrup" and such usually has me running for the hills! But for once I thought I would give one a try if only to prove myself wrong. 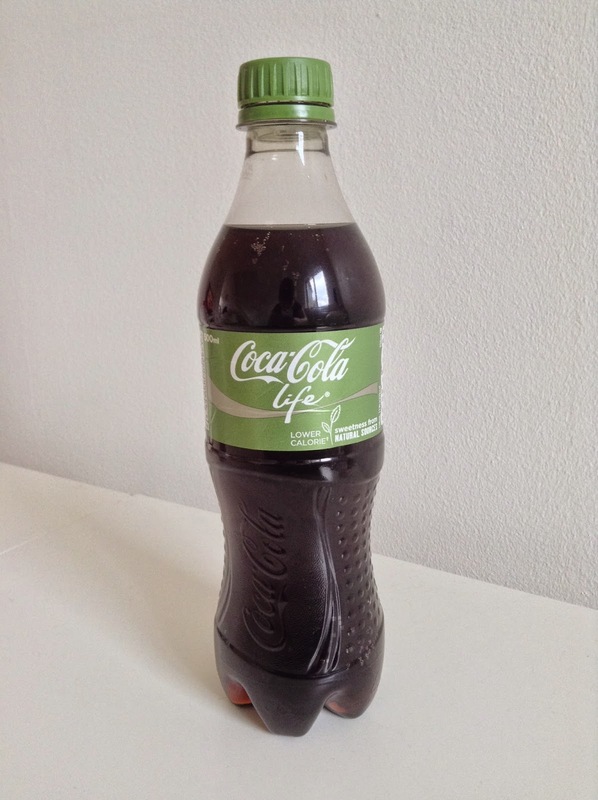 Coca-Cola GB announced back in June the launch of “Coca-Cola Life”, a lower calorie soft drink sweetened from natural sources with a third less sugar than the original Coca-Cola. This is the first new Coke to be launched in the UK since the arrival of Coke Zero in 2006 and to be quite honest, I really don't see what the big deal is? Whilst in Asda recently I spotted these new Choco Caramels from Mentos and thought they sounded rather odd, since Mentos are usually known for chewy mints and fruity sweets. It seems they want to expand into toffees now. They're actually very similar to something I reviewed briefly in one of my Pick & Mix reviews...Meller toffees, by Perfetti Van Melle. Perfetti make both Mentos and Meller so it seems they've just re-branded them. Clever! When I saw these Peanut M&M's in 99p Stores recently I got rather excited...they were in an orange wrapper, contained orange-colored M&M's...and the packet said "Oranje Editie" on it! So of course I assumed they must be an orange-flavoured edition. "How exciting...a new M&M flavour! ", I thought. I should've known better. Because for some annoying reason M&M's constantly repackage their products based on various colour combinations, but never change up the actual flavours...and these are no exception. They're simply a bag of peanut M&M's with orange-coloured shells. Pointless really. They tasted as moreish and addictive as you would expect from M&M's....but without any traces of orange flavour. Why they couldn't have added some is beyond me...it can't be all that difficult, and I'm sure they would fly off the shelves! Whilst in B&M Bargains today I spotted this bar of Hershey's Symphony chocolate. I've never seen or heard of this bar before so thought I'd give it a try out of curiosity. It's described as "Creamy milk chocolate, almonds and toffee chips", which sounded like a simple but tasty proposition. Sadly, the chocolate was far from the deliciousness (yes that is a word!) I was expecting...in fact it was rather sickly, and had that faint taste of "vomit" that many have used to describe Hershey's chocolate as having. It was very weird indeed. Despite the odd flavour, there was something compelling about the chocolate....the thinness of the bar, combined with the crunchy almonds and toffee pieces was strangely moreish. That said, the constant undertone of weird-tasting chocolate ruined it somewhat! Mondelez are cranking out newproducts at alarming speed right now, and the latest to join their ever-swelling range are these Terry's Chocolate Orange Pots of Joy. "Pots of Joy" are usually associated with Cadbury's, but since Mondelez also own Terry's it seems they've deemed it OK to add these to the range too. They're described as "Smooth and creamy desserts made with melted milk chocolate with a rich orange flavour under-layer" and are currently on offer for £1 at Asda. Beech's Fine Chocolates Bar Range - Review & Discount Code! Many thanks to Beech's Fine Chocolates who recently sent me some bars from their new bar range to review. I was excited to receive them as I've been curious about Beech's Chocolates for ages now...I always see them in local department stores and wonder what they're like. Seems I was missing out! Beech's Fine Chocolates have been making quality Traditional British Chocolates from their factory in the centre of Preston, Lancashire since 1920. Their chocolates are made using only natural colours and flavours, all are suitable for vegetarians, and their dark chocolates are suitable for vegans too. As well as that, all Beech's products are gluten-free! To receive a 15% discount from Beech's Chocolates this month enter code ‘BFC11J1415’ at checkout. Many thanks to Bring Back Banjo Chocolate Bar for once again sending some lovely chocolates my way! I've been sitting on these for a while and unfortunately they melted somewhat. Not because of me sitting on them... but because of the heat-wave we had recently! So my apologies that I can't do these justice...they were definitely intact when I received them. First up is this Peanut Butter bar from Wawel...that Polish company I'm not best friends with, since I've had a few duff chocolates from them in the past! Maybe they could woo me back with their peanut butter chocolate...? Opening the wrapper I wasn't too excited...not only because of the melted chocolate, but because it had that distinctly "cheap" aroma that Wawel chocolate is known for. Still, I was hoping the peanut butter filling might save it. Looking at the ingredients list didn't offer me much hope...the bar contains vegetable fat, sunflower oil and other nasties. When I found this bar of Nestlé Le Chocolat Lime on a local market stall recently I just had to give it a try...it's not often you see lime-flavoured chocolates! When I opened the wrapper though, I felt rather disappointed. Not only because of the dusty bloomed appearance of the chocolate, but also because I've tried the same bar before but in different packaging - the Czech Nestlé Orion Lime Cream Bar I reviewed last year. Basically this bar tasted exactly the same, although a little on the stale side due to the bloomed chocolate. It's a tasty bar with a unique tangy lime flavour, but a little sickly in excess. This version is made by the Greek arm of Nestlé and there appears to be quite a few other flavours in the range too. Overall, an interesting bar and if you happen to see one I would recommend giving them a whirl if only for the sake of novelty. Whilst in Asda recently I spotted these new Wispa biscuits so of course I couldn't resist giving them a try. Wispa is such an iconic British brand and it's only made a resurgence in recent years, but now Mondelez are pushing it into new territories; Hot Chocolate, Ice Creams, Bite-Size...and now biscuits! Of course bubbly chocolate combined with biscuit isn't really such a new concept - Fox's did it for a while with their discontinued Echo bars, and Aero also do their own range of bubbly biscuits. How do these Wispa biscuits compare? Firstly they're very differently shaped; they're in the same round shape as the Caramel, Turkish, Creme Egg etc biscuits made by Burton's for Cadbury. 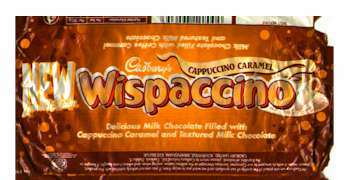 They contain a shortcake base with a layer of Wispa chocolate, fully coated in milk chocolate. The varieties are Strawberry Dreams and Golden Barrels; I don't know if they're doing any other flavours but these are the only ones I saw in my local Co-Op. They're currently on offer for £1 alongside Marvellous Mix-Ups and Terry's Chocolate Orange Minis. Whilst at Tesco recently I found these new Jelly Babies Berry Mix, and like the Cadbury Eclairs Velvets Coffee Flavour they're a Tesco Exclusive. They're basically the berry flavours from regular Jelly Babies in their own bag...nothing all that new or exciting really. The babies have some odd names..."Brilliant", "Big Heart" and "Baby Bonny" and the flavours are blackcurrant, raspberry and what seems to be strawberry, although the ingredients also list apple so it's hard to tell. They tasted pleasant enough but not particularly "berry-ish", if there is such a word...just very sweet. To be honest I wasn't that enamoured with them, they were a bit one-dimensional without the green, yellow, orange etc jelly babies. I wanted some citrus flavours to liven things up a bit! Another day, another new Cadbury product...I'm starting to sense a pattern here. I can't grumble though because it's always exciting to unexpectedly find new chocolate varieties on shelves! This one should please fans of coffee chocolates, of which there is an unfortunate lack of in the UK. Most brands have done coffee variations at some point, of course; such as Kitkat, Aero, Wispaccino, Twix, Maltesers, Galaxy etc, but they never seem to stick around. I guess the flavour just isn't popular enough. Luckily Cadbury's have come to the rescue! Cadbury Eclairs Velvets Coffee Flavour are exclusive to Tesco, and they're described as "Coffee flavour soft caramel with a choclatey centre, enrobed in delicious Cadbury milk chocolate". They're currently on offer for £1. The Eclairs are all individually wrapped, although I could still detect a whiff of chocolate and coffee permeating through the bag. Recently I was sent some chocolates from the lovely folk at Creighton's Chocolaterie, and so far I've reviewed their Lemon Bonbon bar which turned out to be very nice indeed...so here's the rest! This is a high quality white chocolate blended with freshly ground espresso. It tasted lovely! The white chocolate was exceptionally creamy, very good quality and with a decent amount of cocoa butter. The espresso speckles gave it a lovely coffee-tinged flavour that is pleasant but not overpowering - it's tempered perfectly with the creaminess of the white chocolate. A very indulgent bar...I naturally enjoyed it with a cup of coffee!